To start from the beginning, Epilogue, Part 1, Part 2. As I mentioned in my previous post, when my boss suggested I go to ISSCR, I knew I didn’t want to go if I had to go alone. The conference plus travel would mean 6 days away from my little family. I knew I wanted Mac, my husband, to come with me, but I wasn’t so sure about bringing Mabel. Back in October, when Mabel was 9 months old, I attended a conference in Philadelphia. The conference was only 2.5 days and Philly was only a 3 hour drive. Also, at the time, I was still breastfeeding, so, bringing Mabel was a no-brainer. I had been away for an overnight without Mabel once before, having to pump while away, and it was basically 20 hours of being uncomfortable. Breast pumps are wonderful inventions, but they are no substitute for a baby- particularly for me. For me, the pump was never able to do a thorough job of expressing all my milk, so being away from Mabel meant I’d pump, become engorged again in a few hours, and have to pump again. That was tolerable for an overnight, but there was no way I wanted to do that for several days- it was physically uncomfortable, I didn’t have enough expressed milk to leave with Mabel, and it was a risk to my milk supply in general (not completely draining would be a signal to make less milk). So, we went as a family of three. In Philly, it was a hassle running back to the room during all the breaks, and it stunk that Mac and Mabel had to stay close to the hotel so I could nurse, but you gotta do what you gotta do. Being in a hotel room with a 9 month old was not fun. When Mabel woke, everyone was awake. When Mabel went to sleep, we had to turn off the lights and the TV, stay quiet, and try not to disturb her. We could only go out to eat at kid-friendly places, at kid friendly times. Well, breast feeding wasn’t a factor in the decision whether or not to take Mabel to Toronto since she weaned around her first birthday. However, all the other stuff mentioned above did factor in as a ‘con’ to taking her along. The pros included- not having to be away from her for 6 days, getting to take a family vacation, exploring the kid-friendly side of Toronto. Now, the pros/cons of leaving her with Nana and Pop. Pros: sleep (as in not getting woken in the night and sleeping in every morning), go wherever we wanted whenever we wanted whether or not it was kid-friendly, not having to take a 7 hour car ride with a toddler, not cramming in one room, not having to get her Passport. Cons: missing our girl for 6 days! I’m making it sound like it was a debate, but really it wasn’t. There was no way Mabel could have come with us simply for the fact that we didn’t have a Passport for her. So it was decided that she’d stay with her grandparents- who were ecstatic to have her to themselves for almost an entire week! Pop took 2 days from off from work, and Nana took another 2 days. We set up Skype on Nana’s computer, packed Mabel’s bag, met Pop in a McDonald’s parking lot, made the transfer, and hit the road. It was definitely a little nerve-racking to be leaving Mabel for 6 days when we were going to be 7 hours away in a different country. We filled out the necessary paperwork to make sure my parents could make medical decisions for her if necessary, and left an insurance card in the diaper bag. Thankfully none of that was needed while we were gone. As a scientist, compared to the last conference, it was a lot easier to focus during ISSCR without Mabel in the vicinity. During the scientific sessions I was able to let myself become completely engrossed. During the poster session, I wasn’t rushing back for bedtime. So science-wise, it was definitely better to not travel with child. Momma-wise, it wasn’t too bad. The first couple of days were pretty easy. We Skyped and I spoke to her on the phone. However, after maybe the third day, I definitely started to miss her. I would notice other families and wish she were there. I would hear a child cry and instantly think of her. I would wonder what she was doing and really, really wish I could give/get a hug and a kiss. Overall, I think Mac and I made the right decision to leave her with my parents for the week. As a scientist, it was much easier for me to focus on the conference while we were there. As a wife, Mac and I got to adventure together as a couple. As a mom, it was reassuring to know that she’s a capable, well-adjusted kid who didn’t seem to care at all that her parents weren’t there! 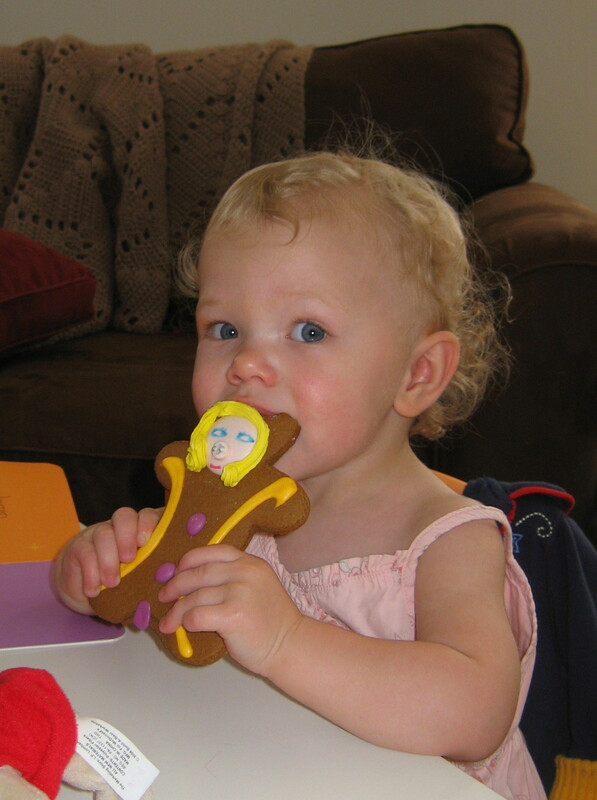 My mom and dad went to Toronto and all I got was this yummy gingerbread cookie!